Trucker-Wages in all 50 states. From the lowest to the best paying states to live in if you’re wanting high truck driver wages. 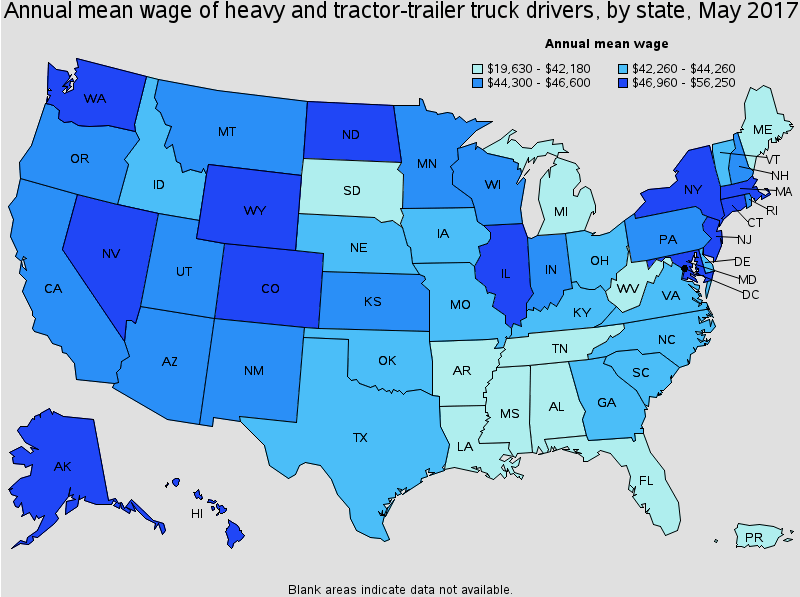 Alaska came in at number one while West Virginia sat at the bottom of the income of the trucking industry. Truck driver pay is on the rise overall this year, but there are some states where drivers earn more. The average income of a long haul truck driver in the Unites States last year was $44,500, according to the U.S. Department of Labor, but the average salary for a truck driver varies dramatically by state. Starting out in the trucking industry can be frustrating for rookies. What most new truck drivers do not understand is that experience is where the money is. Just like with any other job, entry level positions do pay considerably less. Going through a truck driving school that offers employment placement assistance really is your best bet. Inexperienced tractor trailer drivers are a high risk to companies. There are several reputable companies that do pay very well for first year drivers. Swift Transportation is the highest paying company for rookie drivers. Not only can new truck drivers get their schooling through Swift, they can go right into employment with the company when the schooling and training are complete. Swift allows student drivers to repay their tuition and schooling costs over a period of 26 months while employed with the company. On average, first year dry van drivers earn $41,110. Team dry van drivers, in their third year can earn roughly $88,710. The pay does gradually increase year by year, based on performance, safety and experience. Truckers with pockets full of money. Scrutinizing your truck driver pay check is a necessity. These days the costs to the truck driver are soaring. As a result, it becomes more important than ever to insure that you, as the driver, are being paid honestly by your carrier. While many carriers have yet to step up to the plate and pay their drivers for waiting time, there exists another part of the driver’s pay check which deserves some close scrutiny. Because the truck driver’s wages are based on a per mile traveled system, it is paramount in importance to insure that you are beingpaid for all the miles you have driven.